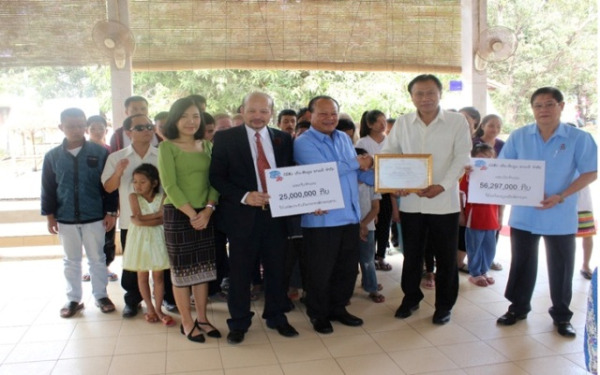 (KPL) Theun Hinboun Power Company Deputy Director General Soulideth Paomanikhot on Jan 31 presented a financial assistance package worth 56.29 million kip to the Lao Blind Children School and other one worth 25 million kip to the National Chess Federation. As for the National Chess Federation, the financial package will be used for organizing a national youth chess competition event. The financial packages were received by Ophthalmic Care and Treatment Centre Deputy Director Siphetthavong Sisaleumsak and National Chess Federation Secretary General Inthava Vilavanh. The handover ceremony was witnessed by officials of the donor and beneficiaries. The cash packages, totally worth 81.297 million kip, were raised through a charity golf competition held last week at Long Thanh Golf Course in Vientiane to mark the 20th anniversary of commercial operation of Theun Hinboun hydropower plant. The event was chaired by Vice President Khamphanh Viphavanh and attended by more than 150 government senior officials and business people.